When temperatures dip and you pull hats, mittens and winter coats out for the season, keep in mind that long johns are another essential layer for keeping warm. Many long johns are sold in a set consisting of a long sleeve shirt and pants. You can also find separates and mix and match a top and bottom of your choice. There are a variety of styles for kids to choose from making long johns not only a necessity, but also a stylish addition to any cold weather outfit. Whether your kids need long johns for school, play or a trip down the slopes, you'll find quite a selection sized just for them. Long johns are available in plenty of prints and patterns that are made to appeal to children of all ages. You can find anything from camo prints to flowers and even solid colors and stripes. Be sure to check the underwear section of the boys' and girls' department of your favorite stores during the winter season to find a selection of long johns. You can also shop online all year. 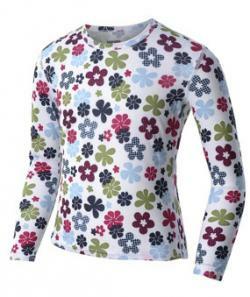 Hot Chillys Youth Pepper Skins Print Crewneck: This long sleeve, crewneck top is done in a soft jersey knit and is perfect to layer under a sweater or jacket. It comes in fun prints for girls such as Flower Power, Blue Cupcakes, and Heart Dance and cool prints for boys such as Charcoal Bots and Pirates. It is priced under $27 and comes in sizes 2/4 to 14/16. Coordinating pants in the same print are available. Bottoms are priced around $27. Both pieces are available in sizes small to large. Burton Girls Heartbreaker Pants: These pants are priced around $35 and come in sizes up to a 14/16. These long underwear bottoms are done in a bold Bohemian Flamingo print and feature a fleece backing. These pants dry quickly and are highly breathable. A matching 1/4 zip top is available for around $40. 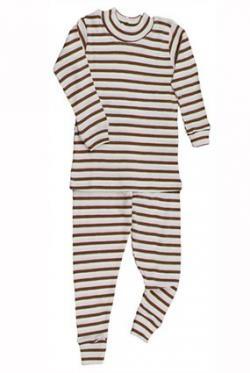 Cocoa & Pink Stripe Long Johns (pictured): This organic long john set is priced around $30 and come in sizes 9/12 month to a youth 12. They are done in a stretch rib design that is super soft and comfortable. They are hand made and feature a crew neck long sleeve top and pull on elastic pants. Orange Creme Long Johns: These brightly colored long johns are priced under $40 and come in sizes 9/12 month to a youth 12. They are done in a bright orange 100 percent organic fabric. The set features a long sleeve top and pants with a covered elastic waist. Coldpruf Cotton Polyester Two Layer Long Johns: This set includes pants and a top and is priced around $30. It comes in colors such as aqua and navy. Youth sizes X-Small to X-Large are available. This tagless style is done with two layers of thermal fabric. It is done with ribbed cuffs and a comfortable flatlock seams. Indera Mills Antimicrobial Unisex Youth Performance Thermal Underwear: Priced around $20, these navy long johns come in sizes Small to X-Large. They are done in a unisex style and feature an antimicrobial silver ion fabric technology to prevents odor retention and are designed to dry fast. The set includes pants and a top. 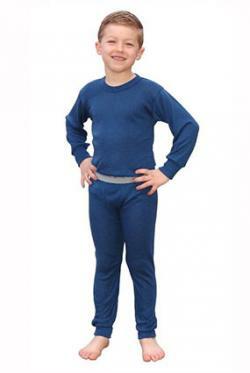 Unlike other clothing items that parents think children can grow into, long johns should be a true fit piece. When shopping for long johns, always purchase the exact size your child is in. Some children like to sleep in long johns and loose, floppy sleep attire can be a fire hazard. Plus, since long underwear are usually worn beneath other layers of clothing, kids will be more comfortable with a close-fitting first layer. If you have a child who resists wearing long johns, the colorful and fun patterns you'll find for kids may change his or her mind. For families who live in snowy climates, these items are a necessary part of a winter wardrobe, so whether your children prefer plain or patterned, there are plenty of designs to satisfy one and all.